I'm in the Flatiron Coffee Bar, Hot Springs, SD, and just helped another cyber-citizen with laptop wireless security. Hot Springs has very interesting old stone buildings. I'm staring at stone walls in this beautiful business as I write and consume my morning dose of caffeine. Some of the local sandstone was carved with fine detail to adorn the structures. Of course, it was Black Hills gold on stolen Indian land that made the initial construction boom possible. And, to add insult to injury, their sacred hills were defaced with busts of presidents of the invaders, modern Mount Rushmore. Tourism apparently drives the modern economy. There are so many mounds at Cahokia, it took all day to do GPS readings even with clear skies and perfect conditions. Perfect conditions for GPS, not for humans given the foul stink of St. Louis' pollution and smog. The wind was out of the west; my respiratory tract will recover in about a week. I've never smelled a city this foul before, and I've been to Tenochtitlan. The stink, and heavy metal taste for that matter, was at its worst atop Monks Mound, 100 feet above the American Bottom. 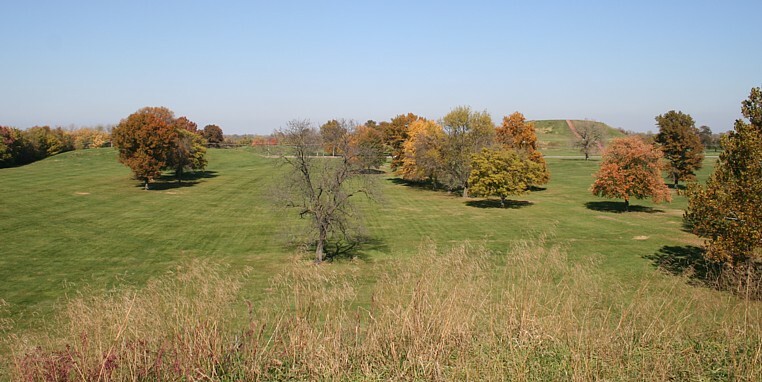 Cahokia is the largest pre-Columbian settlement north of Mexico, once covering about 4,000 acres. 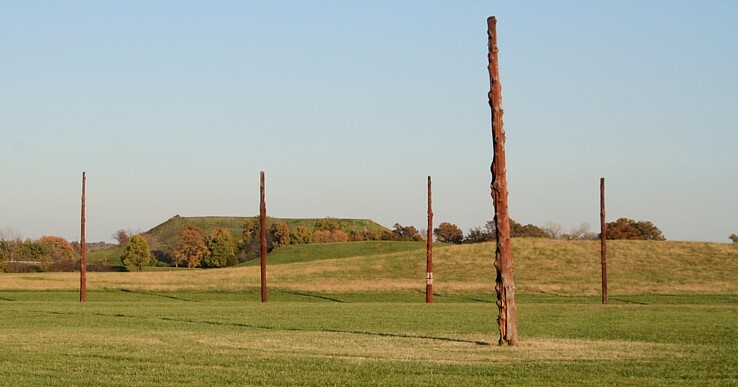 Cahokia is also a UNESCO World Heritage Site. Cahokia is an expression of a culture termed Mississippian by archaeologists, dated from about 800 A.D., well after Hopewell times. A major distinction between Hopewell and Mississippian societies is the degree of social stratification. Archaeological evidence indicates that the Hopewell were far more egalitarian, the Mississippian more stratified with likely state formations. 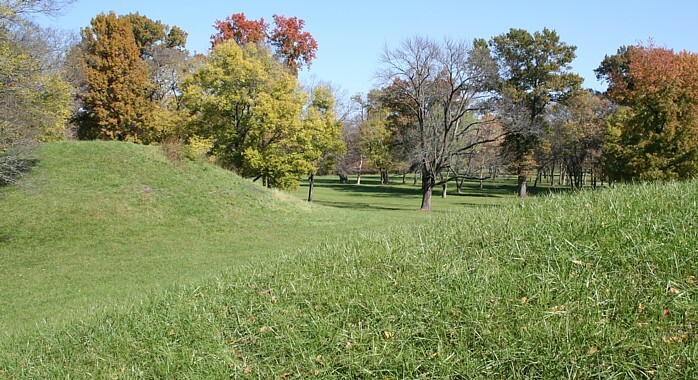 Of the 120 Cahokia mounds originally known, the locations of 109 have been recorded by archaeologists. Of these, about 70 are preserved in the 2,200 acre Cahokia Mounds State Historic Site. Over 50 million cubic feet of earth were moved in their construction, according to one estimate. Monks Mound is one of the largest prehistoric earthen construction in the Americas, with an estimated 22 million cubic feet of earth during several construction phases between A.D. 900 and 1200. More images of Monks Mound follow below. One of the great features at Cahokia today is the impressive Cahokia Mounds Interpretive Center, one of the finest archaeology site facilities in the world. Much to my surprise, it now closes on Monday and Tuesday due to budget constraints. One of the Cahokia web sites is down for the same reason. Due to its location amidst the mounds, archaeological excavation was required before construction. Some in situ ancient features are incorporated in the museum. Even the front patio illustrates the locations of ancient building post molds. These are visible seven days a week. This small mound is noted for 300 burials of mostly young women, and a male burial on a blanket of more than 20,000 beads of marine shell. A large cache of burial goods was also uncovered. Four male skeletons without heads or hands were found near a pit with the skeletons of 53 young women in a mass burial. This type of mortuary evidence reinforces the view that state-level government formations and class stratifications existed at Cahokia. These two large mounds are located south-southwest of Monks Mound, west of Mound 72. The same leafless tree is in the center of the following image. The next image views northeast towards the large Twin Mounds on the south side of the Grand Plaza. Monks Mound is on the north side of the Grand Plaza. The following view northward, across the Grand Plaza from atop one of the large Twin Mounds, includes Mound 48 on the left. Mound 48 is a large, truncated pyramid, the southernmost of three along a north-south axis. The other two, Mound 41 and Mound 39, are located along the west edge of Monks Mound. 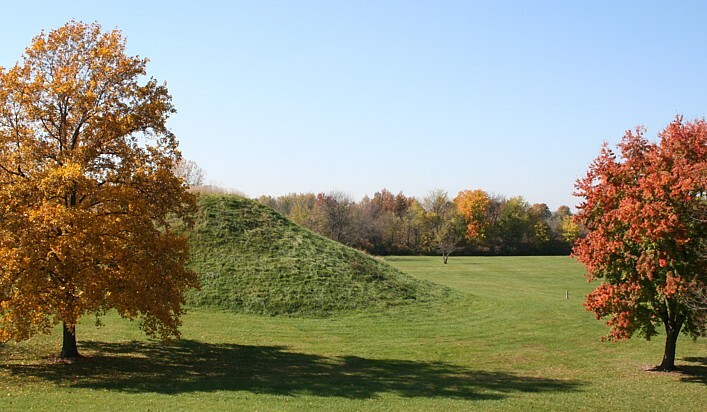 After 100' high Monks Mound, these two large mounds are the tallest at Cahokia. 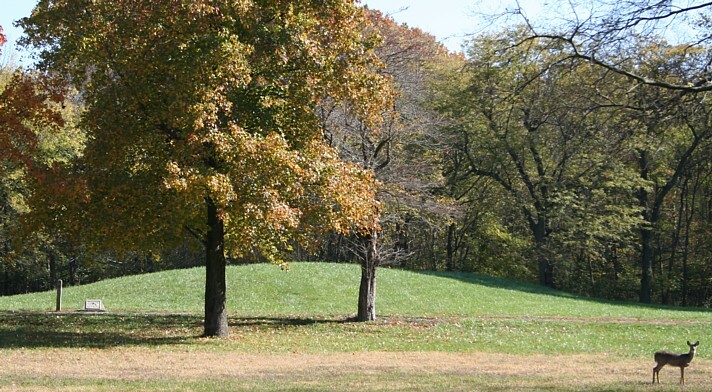 Mound 59, in the photo below, is a conic mound not unlike the Adena mounds. Mound 60, the other Twin Mound and the camera position in this photo, it a tall pyramid mound truncated near the top with a level platform. Another row of mounds extends westward from Monks Mound. The views below are from the west and south sides. Modern stairs ascend the center of the south face. Archaeologists discovered a circle of post molds west of Monks Mound. The remaining evidence was used to reconstruct "Woodhenge," a 410' in diameter circle of large posts. The earthen ring surrounding Stonehenge fits inside this circle. In the image below, the slight difference in elevation between Terrace 3 and Terrace 3 atop Monks Mound is visible behind the post. The posts are regularly spaced and cardinally aligned. The latitude at which the solstice rise and set horizon azimuths form a sixty degree angle was a short distance south of Cahokia at the time the original Woodhenge stood. The Woodhenge builders placed their central post slightly off-center to align to the solstices using the posts set at the 60 degree angle. Archaeologists determined the size of the tree trunks, the species and the paint used, red ochre. Several other arcs of post molds have been recorded in the area. I crossed the Mississippi after dark, beginning a long journey back towards the Pacific Northwest, bucking the winds. © 2005 James Q. Jacobs. All Rights Reserved.